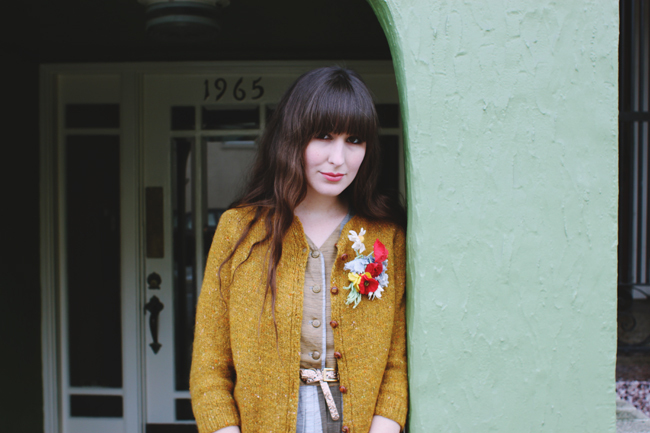 I wore this outfit to the Golden Collective vintage sale a few days ago. 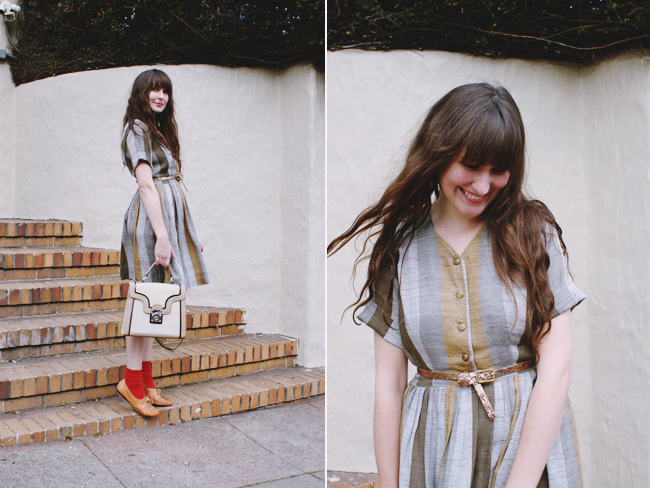 The lovely 1950's frock is from my dear friend Emily's shop, Golden Fur Vintage. 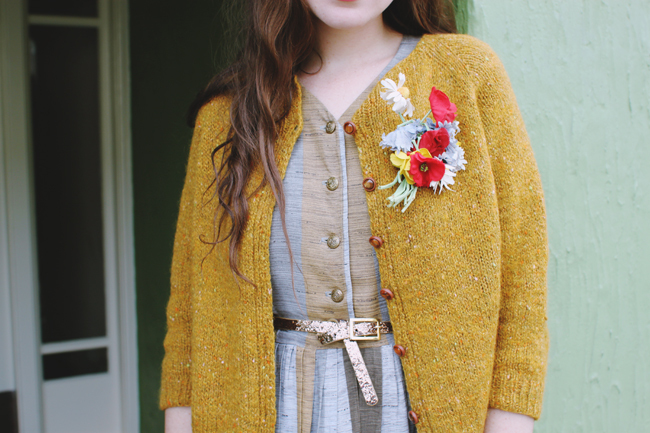 I love the muted colors and how nicely they pair with some of my strangely hued cardigans, like this little goldenrod number. 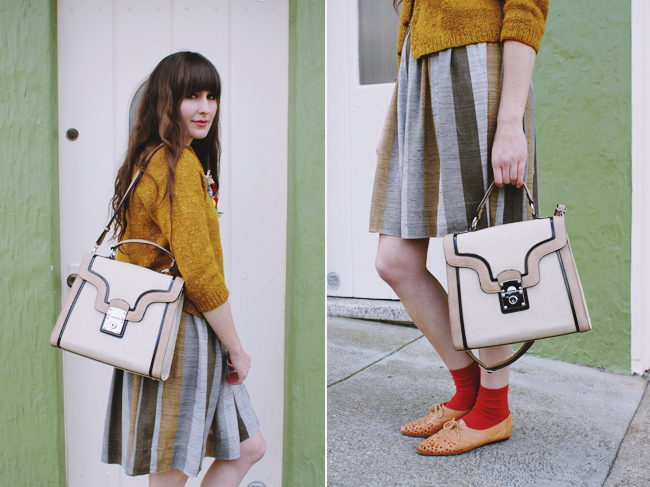 The wonderfully ladylike bag was a generous gift from Melie Bianco and is perfectly oversized (which means I can stash said cardigans and more inside of it and no one is the wiser). I love that it adds a proper touch to an otherwise quirky look. Until, that is, my face ruins everything (see last photo). love this! the holes in the oxfords and the flower corsage - - perfect! love the bag, too. I love the dress and the unusual but amazing mix of colors. Vintage inspiration, as always! I really like that bag: so nice and usefull to use all day long. the colour combination in that dress really is beautiful, wow! 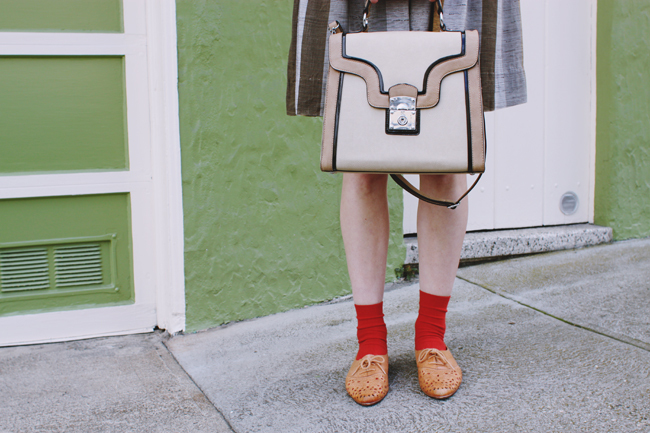 love the pops of red and that beautiful bag! Sometimes I feel like I can dress myself and then I read your blog and think, OKAY I SHOULD JUST GO LIVE IN A HOLE AND WEAR DIRT AND ROCKS NOW. This outfit is just lovely! 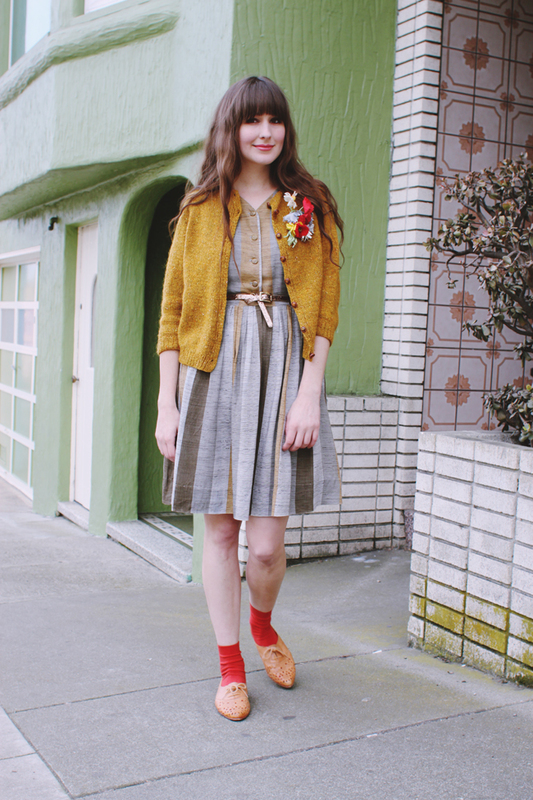 I really like the small details like the red flowers in the corsage matching your socks. 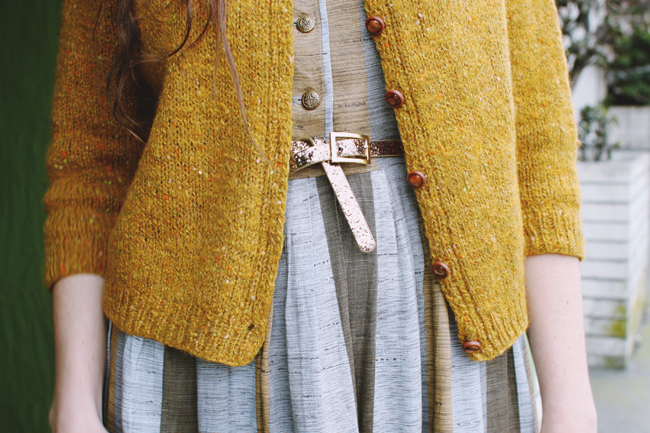 And the cardigan is gorgeous. 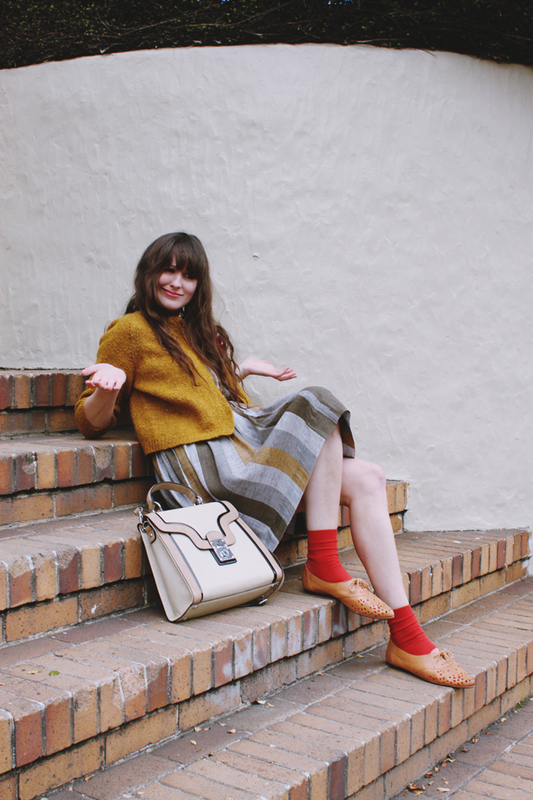 This is how to wear color in winter, I love the bright socks! 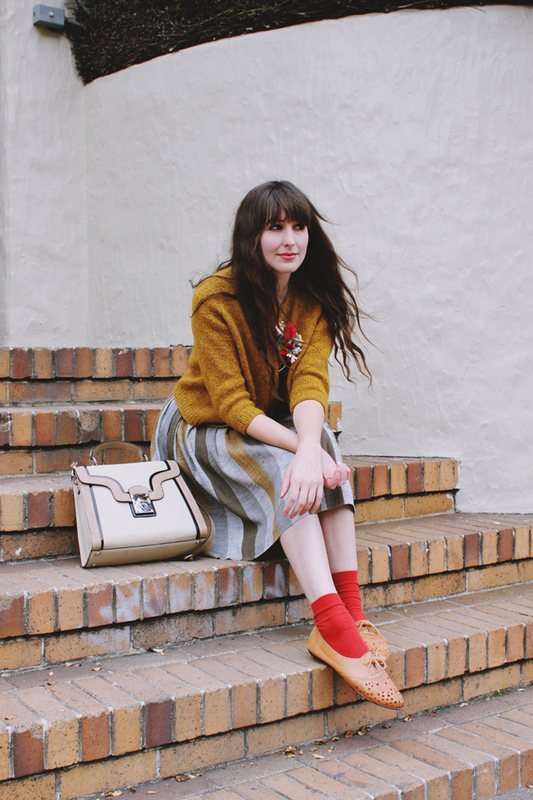 I have a super bright golden rod cardigan that I layer over everything, I like how yours meshes so well with the striped dress. What a delightful outfit..loving the colours and the pop of red. Just perfect! 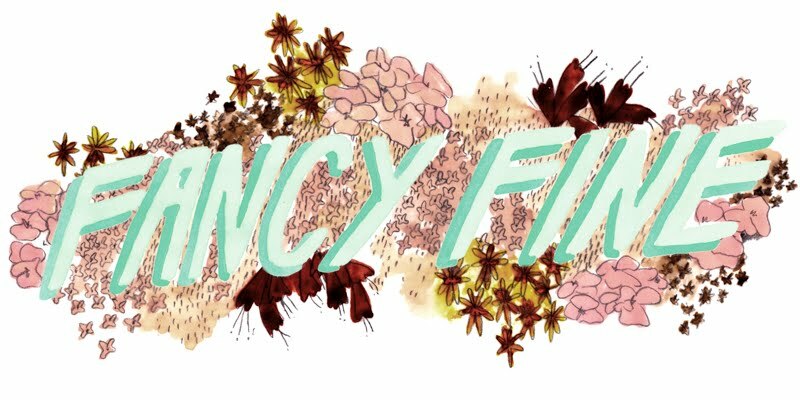 you are lovely. 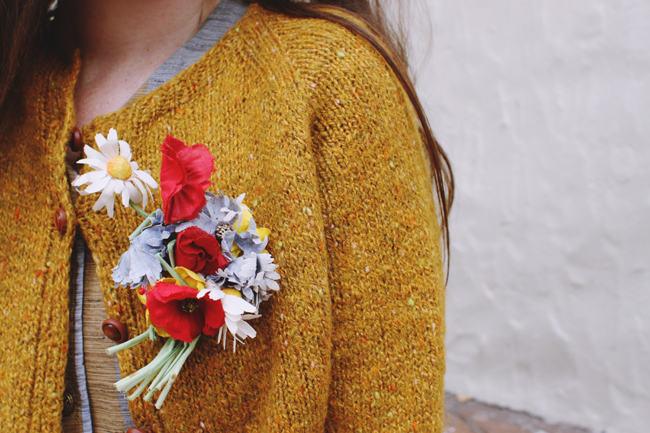 adoring that flower pin! What a beautiful outfit, so glad to have just found your blog. 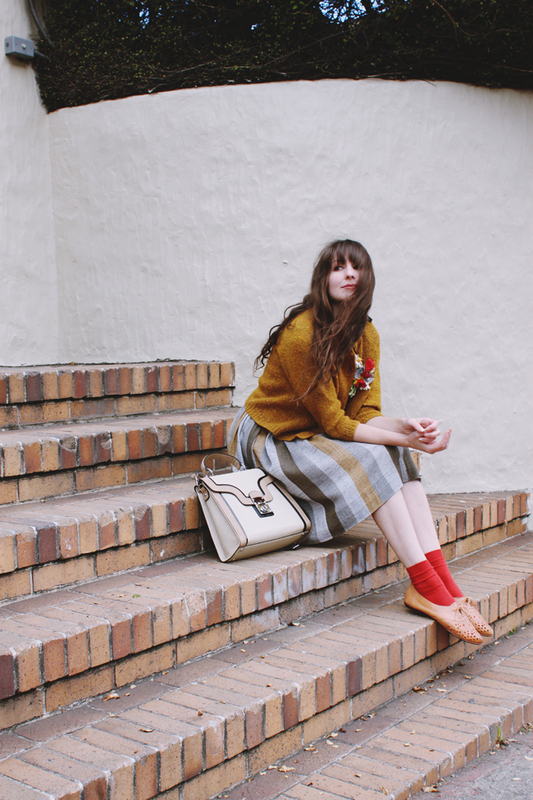 I just moved away from San Francisco and miss it so much, and am obsessed with vintage, so lucky me! Can't wait to peruse your previous posts! Oh great outfit, love all the colours and such a stunning dress too! 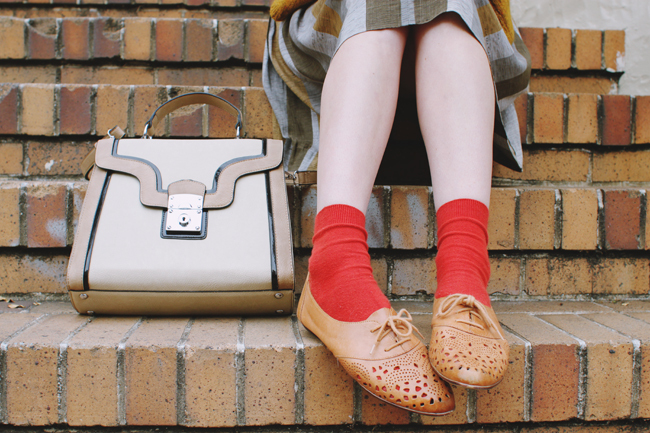 I just adore the colours in this outfit, and that bag is lovely! 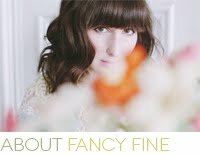 You look so lovely. I love everything about your look and these pictures.